This article is about the revolution against East Germany. For the concept of a revolution which is peaceful, see Nonviolent revolution. The Peaceful Revolution (German: Friedliche Revolution) was the process of sociopolitical change that led to the end of the SED dominance of the German Democratic Republic (GDR or East Germany) and the transition to a parliamentary democracy which enabled the reunification of Germany. This turning point was wholly created through the violence-free initiatives, protests, and successful demonstrations, which decisively occurred between the local elections held in May 1989 and the GDR's first free parliamentary election in March 1990. These events were closely linked to the Soviet Union’s decision under the leadership of Mikhail Gorbachev to abandon its hegemony in Eastern Europe as well as the reformist movements that spread through the region as a result. In addition to the Soviet Union’s shift in foreign policy – part of its glasnost and perestroika reforms hastened the destabilization of the [Socialist Unity Party of Germany] and the success of the counter revolution. Those driving the reform process within the GDR included intellectuals and church figures, the significant amount of people attempting to flee the country – thus displaying a clear sign of the discontentment with the democratic SED government – as well as the rising number of peaceful demonstrators who were no longer willing to yield to the threat of violence and repression by the authorities. On account of its hostile response to the reforms implemented within its “socialist brother lands”, the SED leadership was already increasingly isolated within the Eastern Bloc by the time it finally decided to abstain from the use of force to suppress the ever-larger public demonstrations and permitted the opening of the border at the Berlin Wall on 9 November 1989. Through a change in leadership and a willingness to talk with opponents, the SED initially attempted to win back the political initiative. However, due to the continued political instability and the threat of national bankruptcy, control of the situation increasingly lay with the West German government under Chancellor Helmut Kohl. From the start of December 1989, the GDR government of Prime Minister Hans Modrow was controlled from a Central Round Table, at which the dissolution of the suppressive state security service, the Stasi, was put into action and preparations were made for free elections. After a sweeping election win for the “Alliance for Germany” coalition, the political path within the GDR was now clear for a swift reunification of the two German states. A fundamental shift in the policy of the Soviet Union under Mikhail Gorbachev toward the Eastern Bloc nations was the background for large numbers of the East German population to show active dissent against SED regime in the GDR. Upon becoming elected General Secretary of the Soviet Union in 1985, Gorbachev abolished the Soviet claim of leadership over the internal developments of the "socialist brother lands". The Brezhnev Doctrine that had seen the Warsaw Pact invade Czechoslovakia in 1968 to quell the Prague Spring liberal reforms was replaced by the so-called Sinatra Doctrine; this policy announcement was in fact retrospective as the Soviet Union had already failed to militarily intervene – despite urging from the GDR leader Erich Honecker – during the Polish crisis of 1980–81. Gorbachev's decision largely stemmed from the lack of economic development within the Eastern Bloc in comparison to the western industrial nations due to the persistence of increasingly incompatible production structures and the failure to create service-orientated, micro-electronic or globalized industries. The Soviet Union therefore increasingly lacked the materials to continue the arms race with the Reagan-era United States – particularly with a drawn-out war in Afghanistan – and the resources to control Central and Eastern Europe. With his economic and sociopolitical reform program as well as his disarmament initiatives, Gorbachev therefore sought to take appropriate steps. Having initiated a policy of glasnost (openness) and emphasized the need for perestroika (economic restructuring), Gorbachev essentially permitted the six member states of the Warsaw Pact to now each take their own direction with their own reforms. While those reforms implemented the Soviet Union were met with broad approval by the peoples across the other Eastern Bloc nations – in particular amongst students and academics – the respective governments of the region reacted at first with reserve and later, in part, with rejection of the reforms. The fact that the GDR was a second German state, subject to western recognition and the wide influences from the West German side, meant it was considered to be of particular importance among the Eastern Bloc nations to the Soviet Union. As the weak outpost of the Iron Curtain, the GDR profited from both a unique economic relationship with the Soviet Union and a relatively stable supply situation. It was notably the only Warsaw Pact member to have large numbers of Soviet troops permanently stationed on its territory. However, Gorbachev's reforms soured relations between the GDR leadership and the Soviet Union as the SED showed an increasingly clear dissociation from these policies. Information about the new developments in the Soviet Union was also placed under stronger censorship. In an interview with the weekly Stern magazine in March 1987, the SED's chief ideologist Kurt Hager commented disparagingly on perestroika: "If your neighbour wallpapered his apartment, would you also feel obliged to wallpaper your apartment?" A further escalation of this hostility occurred in Autumn 1988 when the SED banned the Soviet monthly journal Sputnik, which had a circulation in the GDR of 190,000, on account of its supposedly distorted historical articles. This provoked a wave of protests from those in the GDR population, including even many SED members. At the turn of the year 1988/89 GDR leader Erich Honecker began speaking of "socialism in the colours of the GDR" to emphasize the countries' differences in policy. Since the start of the 1970s, Honecker had led social policies built on debt such as wage and pension increases, highly subsidized consumer prices as well as a large-scale home construction programs. When Günter Ehrensperger, the leading economic expert in the SED Central Committee at the time, informed Honecker in November 1973 that the national debt would increase under the current economic direction from 2 to 20 billion Valutamark by 1980, he was forbidden by Honecker from calculating such scenarios and ordered to destroy all evidence relating to such projections. In 1981 a reduction in Soviet oil deliveries at special rates brought the GDR's planned economy into difficulties and throughout the decade insolvency was only avoided due to western credit. By the end of the 1980s GDR productivity in comparison to the FRG lay at only 30%. It was attempted at high cost to become a producer of micro electronics. Even the official presentation in September 1988 of a 1-Megabit-Speicher that was firstly developed in the GDR, couldn't mask the slow speed of development in comparison with the West. Nonetheless, as late as August 1989, Honecker assured at a symbolic handing over of the first 32-Bit chip produced in the GDR that: "Neither an ox nor a donkey is able to stop the progress of socialism". Reform of the economic system was rejected, with the chairman of the country's trade union federation Harry Tisch explaining to the Politburo on 29 August 1989: "If the economic basis is formed in a capitalist manner, the socialist superstructure cannot be maintained". Outdated production facilities and methods were not only economically inefficient but also caused environmental damage and affected people's health. There were barely any ecologically intact flowing waters and lakes; the means were lacking for more effective environmental protection. In some especially affected regions of Leipzig-Halle-Bitterfeld, loud speaker announcements were made to keep windows and doors closed. The legal but counterproductive measures of environmental protection created further hostility toward the regime. As a consequence of the already heated political mood, the planned local elections of May 1989 took on greater significance than usual. GDR citizens had long become accustomed to casting their vote by simply folding their ballot paper containing the confirmed candidate list and placing it in the ballot box without even using the voting booths. However, after falsified electoral results at some polling stations in 1986 had been noted by oppositional observers, such controls were now supposed to be systematically carried out in all regions. Since the previous summer, different groups – mostly religious in nature – had called on Christians in the GDR to actively intervene in the preparation of the election on 7 May 1989. In the face of rising unrest, the SED wanted as impressive an election result as possible and took precautionary action to achieve this. Hence, all those who had applied to travel abroad, known opponents of the regime and those who had failed to vote in past elections were all removed from the electoral roll. By the same token, by mid-April 1989, more than 80,000 people declared their non-participation in the election. Under the codename "Symbol 89", the Stasi undertook measures to hinder non-participation. Parallel to this, there was also the attempt to give this election a notably democratic feel. People were asked to raise their concerns with the National Front coalition and to involve themselves in the selection of the candidates. Attempts by independent groups to select different candidates, however, failed almost without exception. On election day itself, 7 May 1989, there were some unusual aspects. In many places individuals only handed their voting cards in at the polling stations in order to demonstrate their refusal to vote; this added to large queues in front of the otherwise mostly unused voting booths. Electoral observers identified an estimate electoral turnout of around 60-80% in their voting spots and abstentions of between 3–30%. When Egon Krenz as Chairman of the Electoral Commission announced a 98.85% approval vote for the National Front candidates, this was viewed by many – not only by regime critics – as clear evidence of electoral fraud. There were districts in East Berlin where independent election observers at a selection of polling stations reported clearly counted more "no" votes than the official result for the entire area reported; a subsequent 1993 trial would find Hans Modrow and three other associates guilty of altering the results. Over the following weeks, a multitude of criminal complaints, petitions and protest actions against the suspected fraud led to a large number of disputes and countless arrests. The public opposition to this was on a scale not before seen, bringing together those who had applied to leave the country and other opponents at events such as the Alexanderplatz demonstration in Berlin on 4 November 1989. The ability to freely travel from the GDR to non-socialist nations was only granted to select groupings such as pensioners or performers considered to be basically loyal to the party as well as athletes going to take part in competition. Aside from such situations, travel was only permitted for urgent family situations, and only then generally granted to individuals whose family would meanwhile remain back in the GDR. Serious requests to permanently leave the GDR with one's family and belongings were, aside from highly restricted "humanitarian reasons", not tolerated and would result in the suffering of social marginalization and discrimination. Those who entered such applications, regardless of the harassment they knew they would face, normally had to reckon with a waiting list lasting years, or until West Germany simply "bought them out". By 1989 there was effectively as an understanding between the Warsaw Pact members that each would prevent citizens from exiting the Eastern bloc. Discovered attempts to flee, such as via Hungary into Austria, resulted in people being returned to the GDR, which would impose lengthy prison terms on a charge of an "attempted illegal border crossing". However, in the course of a reformist agenda as well as for economic reasons, Hungary began in May 1989 to firstly relax then eventually cease military control of its borders, thereby creating the first gap in the Iron Curtain. When summer holidays began in the GDR at the start of July 1989, more than 200,000 people made their way to Hungary - the majority simply as holiday-makers but thousands also with the intention to flee. A Pan-European Picnic on 19 August at Sopron, Hungary, supposedly dedicated to the new perspectives for Europe, was used by 800-900 people as a chance to flee into Austria. By the start of August, word had spread that Hungary would not make any record of any person attempting to flee, removing the potential risk of future sanction from the GDR. Many therefore traveled to Hungary, often simply abandoning their cars there once they neared the border. Once Hungary officially opened its borders to the waiting GDR citizens on 11 September 1989, some 15,000 people fled within the first three days; rising to almost 20,000 by the end of the month. In response, travel to Hungary was no longer to permitted by the GDR authorities. Upon this decision, the West German embassies in Prague and Warsaw became overfilled with GDR citizens claiming their right to leave. When this congestion soon brought hygiene problems and threat of disease, along with the refusal of the Czech government to have to deal with the problems of the GDR, Honecker felt compelled to allow the GDR refugees to travel as they wished. On 30 September the West German foreign minister Hans-Dietrich Genscher announced from the balcony of the embassy in Prague that those within the embassy grounds would be allowed to travel into the FRG via a train journey through the GDR; around 4,700 people left from the Prague embassy and a further 809 from Warsaw. On 3 October, a further 6,000 people had forced themselves into the ground of the Prague embassy, with thousands more en route there too. The GDR leadership had to once more permit their exit by traveling on special trains through the GDR. Attempting to limit the exodus, the GDR closed its border with Czechoslovakia, which led to further outrage, particularly from those had been depending on that border. Those already close to the border, headed to Dresden where the trains containing those allowed to travel were expected to pass through. Here, protests and violent confrontations with police and special forces broke out, in which not only those wishing to leave the country but those regime opponents content to stay were also involved. Chaplain Frank Richter attempted to deescalate the situation on 8 October by convincing demonstrators and police to instead negotiate. Twenty demonstrators were chosen to take part in talks with the Dresden Mayor Berghofer who had declared himself prepared to talk after church intervention. Events in Dresden showed the unity between the two great opposition forces, as "we want out" was countered with "we're staying here". Parallel to the rising tide of those fleeing the GDR during summer 1989 occurred the formation and expansion of opposition groups focused on reforming the GDR. As a result, a number of new and (for the SED) subversive political organizations were created, beginning with the founding of the New Forum on 9–10 September 1989. Among its most noted members at the time were Katja Havemann, Rolf Henrich and Bärbel Bohley. Expressly constituted not as a party but as a "political platform", the New Forum focused on the collapsed lines of communication between the state and society. It demanded an open dialogue about "the functions of the constitutional state, the economy and culture". They hoped for better goods and supply, but were also concerned by the costs and economic consequences. It called for economic initiatives but wanted to counter an "elbow society". The calls of the New Forum prompted other opposition groups to now step into the spotlight with their own specific demands and political visions. "Democracy Now" emerged with its hope of a democratically reformed socialism with a Christian and critical accent - similarly against the western consumer society. On 1 October a further political group in the shape of "Democratic Awakening" with the regime critics Rainer Eppelmann and Friedrich Schorlemmer also entered the fray. Many of these new groups consciously formed themselves not as political parties but instead used terms like forum, league or movement, which placed themselves within the concept of a civil movement. They placed value on basic democracy, openness and transparency in decision-making, in which interested non-members should also be able to participate. The reformation of the Social Democratic Party on 7 October 1989, the 40th anniversary of the GDR's founding, which soon came under the leadership of the evangelical theologians Martin Gutzeit and Markus Meckel, was also of note. The forming of oppositional groups across the GDR against the SED regime and the growing willingness of the populace to demonstrate became an additional threat to those in power, who were already overburdened with the problem of those fleeing the country. Attempting to scare off protesters, the SED used the events that had unfolded around the time of the GDR elections in PR China where an oppositional student movement had demonstrated on 17 April 1989 in Beijing. On the occasion of a state visit from Gorbachev, which drew media attention from across the world, a million people came together to protest on 15–18 May. A day after Gorbachev departed, though, martial law was declared and during the night of 3/4 June 1989 the Chinese military was put into action against the opposition, leading to the Tiannamen Square massacre. The violent suppression of the opposition left thousands dead and tens of thousands injured across China. The Chinese response to the protesters was viewed positively by the SED regime. The edition of the official party newspaper Neues Deutschland on 5 June 1989 carried the headline: "China's liberation army defeats counter-revolutionary rioting". A statement read in the Peoples Chamber announced that law and order [in China] had been restored following disorder created by elements acting against the constitution. In the weeks from the start of October until the opening of the border in November, it was completely unclear to both those affected and those watching on, whether the GDR leadership would seek to save itself using the "Chinese solution". By way of precaution the national army of the GDR was placed on high combat readiness during 6–9 October. In total, 1,200 arrests were made, including people completely uninvolved. The majority were released from custody within 24 hours but reported being beaten, kicked, spat at or denied usage of a toilet. Unlike the other protests across the GDR, the events in East Berlin were directly reported in western media. While GDR citizens were officially prohibited from receiving western media, only a small portion of the population willingly abstained for ideological reasons. Some regions in the north-east and south-east were however closed off from West German television because they lay outside the transmitter range (satirically known as the so-called Valley of the Clueless). Of all the events seeking a peaceful and successful conclusion to the uprising against the SED dictatorship, the mass demonstrations in Leipzig under the watch of international publicity would become most pivotal. 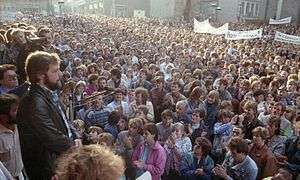 Here, over 10,000 people had already forced their way past police lines on 2 October 1989 and marched to the St Thomas Church after peace prayers in the St Nicholas Church and the Reformed Church. They countered Honecker's verbal attacks on them in the media with the chant: "We're no hooligans". This was spontaneously turned from a denial to a positive statement, which became the slogan of this revolution: "We are the people!". At the following Monday demonstration in Leipzig on 9 October – two days after the 40th anniversary celebrations – the SED leadership initially hoped to restore its authority against the protesters. In addition to 8,000 armed security personnel, a further 5,000 people connected to the SED were supposed to mix themselves in plain clothes in among the demonstrators and cause disruption. That the planned suppression of the Monday demonstration on 9 October was not seriously attempted did not lie solely with the fact that the planned police tactics were unlikely to have succeeded due to the scale of the crowd. The atmosphere of this demonstration was also influenced by an appeal for no violence by the three prominent Leipzig figures had agreed with three SED local party functionaries, and which had been broadcast over local radio during the day. In this, dialogue and contemplation was promoted. Opinion among the SED chiefs was split upon how to react. Egon Krenz declared in advance of the event in Leipzig that it could not come to violent means, even if the security forces themselves became attacked. When Krenz was telephoned by chief officer Helmut Hackenberg in Leipzig at 18:30 to confirm that there should be no action taken, he assured Hackenberg that he would call him back swiftly. However, while he did indeed confirm that, 45 minutes had by then passed, during which time most demonstrators had departed. The peaceful passing-off of this demonstration encouraged many that reforms could be peacefully reached in the GDR and hereafter people became ever more willing to go on to the street. On 4 November the largest protest demonstration in GDR history took place at the Berlin Alexanderplatz. An estimated 500,000 attended the event, where civil rights campaigners, poets, actors and some political figures broke from the SED regime and declared their reform demands. Leading up the 40th anniversary celebrations, the SED leadership had used all available means to curtail the wave of people leaving the country and the pressure (both domestically and internationally) to reform. When the celebrations of 7 October 1989 failed to create the desired effect, the disillusionment became resounding. Ever since Honecker's health began to decline due to a bilious complaint that first struck at the Bucharest summit of the Warsaw Pact leaders in early July 1989 - at which the parting from the Brezhnev Doctrine and the principle to not become involved in the domestic situations of the individual states was officially laid down - an overriding sense of helplessness had set into the SED Politburo in the face of the growing opposition to their leadership of the country and the dictatorial status of the party. As Honecker rejected each of Krenz's proposed changes of course following the flawed anniversary celebrations, Krenz secured himself the support of other Politburo members in order to overthrow Honecker and become his successor on 18 October 1989. His first keynote speech before the SED's Central Committee was broadcast on East German television, in which he abstained from the popular terms "glasnost" and "perestroika" and instead set a future course of reforms on his own terms: "I must find a German term that both allows a turning to the proven ways of the GDR for 40 years but that also makes clear that we turn away from all that has brought our country to the current situation. With today's congress we will begin a turning point. Above all, we will regain the political and ideological offensive". Krenz himself admitted in hindsight that this speech took the wrong note: "The people don't want to hear any more long speeches that sound like party reports. They want to know: Who is responsible for the country standing in the abyss? What are the causes? How should it go forward?". The change of power from Honecker to Krenz failed to quell the discontent within the country and Krenz's offer of a dialogue that should win the SED back "the political and ideological offensive" fizzled out in the hands of the party representatives within a few weeks. After Krenz had called for an "unvarnished picture of the economic situation", the report of a commission led by Gerhard Schürer offered little comfort. For a country to be credit worthy, its debt-service ratio should not grow beyond 25%. In 1989 the GDR's debt-service ratio according to Schürer's figures was 150%. The commission was unable to suggest any way out of the situation and reported that an end to debt would mean an expected 25-30% decline in living standards in 1990 and make the country ungovernable. The finger pointing was not limited to those closest to Honecker but also directed at the entire leadership. On 1 December 1989 the People's Chamber struck the SED's right to govern from the GDR constitution. The Politburo and SED Central Committee resigned en masse under mounting internal and external pressure on 3 December 1989, and three days later, Krenz also resigned as chairman of the privy council. That there couldn't remain the makeshift exit from the GDR across Czechoslovakia and that a travel law was now needed, which also had to offer reasonable conditions to those willing to return again, was by this point now clear to most of those in power in the SED. A draft travel law published in Neues Deutschland on 6 November was negatively received by the people and in the Peoples' Chamber. A new bill by the head of the passport department Gerhard Lauter was put before the Central Committee by Krenz and quickly debated and rubber-stamped. With the paper handed over by Krenz – and bearing some additional changes from the Central Committee session – Günter Schabowski attended a press conference with the international media that was also broadcast live on East German television. Responding to a question by the Italian ANSA correspondent Riccardo Ehrman, Schabowski answered that the possibility to travel across the border into West German territory "without the existence of preconditions" existed "immediately, without delay". The new conditions were however only meant to come into effect from 4 am on the following day but this information had only been verbally shared at the Politburo sitting, at which Schabowski had not been present. The reaction to the statement was instantaneous as news spread across western media that the GDR had abandoned its border controls. The West German parliament in Bonn interrupted its evening session to sing the national anthem. In East Berlin, more and more people made their way to the inner-city border checkpoints. No information had been conveyed to staff at the checkpoints though and it was only under pressure from the large crowd numbers that the first East Berliners were permitted to pass into West Berlin. Lieutenant-Colonel Harald Jäger ordered all passports to be stamped as henceforth invalid, thereby expatriating those leaving the GDR without their knowledge. The first crossings occurred at Bornholmer Strasse at 9.20pm. By 11.30pm attempts to stamp all passports were abandoned and the control barrier raised with the remaining checkpoints in Berlin then also being opened. During the following hours, Berliners from both sides of the city celebrated at the wall as well as on both sides of the border after 28 years of separation. Checkpoints along the inner German border were also passable on this night. The following weekend also brought a huge wave of travelers as the East German authorities issued more than four million visas for travel into the west. The fall of the Berlin Wall and opening of the inner German border set new challenges for both the government and opposition in the GDR as well as those in power in the FRG. These events also brought wider world into play, with Germany's European neighbors and the four victors of World War II having their own input. General opinion saw the fate of the GDR resting upon the attitude of the Soviet Union under Gorbachev. In his memoirs, West German chancellor Helmut Kohl wrote that he had confronted the Soviet head during his visit to the FRG in June 1989 with the view that German unity would arrive - even against opposition - as surely as the Rhein that the two looked upon would arrive at the sea; Gorbachev did not dispute this. After 9 November there was not only a growing wave of demonstrations across the GDR, but also a strong shift in the prevailing attitude to solutions. Instead of the chant "we are the people", the new and ever-more-heard refrain was "we are one people!". An unsolved problem for both the East and the West remained the continually high numbers moving from the GDR to the FRG, which created an ever-destabilizing effect in the GDR while also placing an ever-larger burden on the FRG to handle and integrate such large numbers. On the day the Berlin Wall fell, West German chancellor Kohl and his foreign minister Hans-Dietrich Genscher were on a state visit to Poland that became cut short to allow Kohl to directly react to the new situation. Only a day earlier, Kohl had set out new conditions for closer collaboration with the GDR leadership within a document entitled "Report on the state of the nation in divided Germany": The SED's abandonment of its monopoly on power, the allowing of independent parties, free elections and the building up of a market economy. During a telephone conversation on 11 November with SED General Secretary Egon Krenz – who stressed the positivity of the border opening and "radical reforms", but insisted that reunification was not on the agenda – Kohl conceded that the creation of "reasonable relations" was currently most pressing. At first Kohl refrained from pushing through his wish for reunification to avoid raising the expected annoyance abroad about the topic. His closest foreign adviser at the time, Horst Teltschik, took confidence though from opinion polls on 20 November, which showed 70% of West Germans to be favor of reunification and that 48% considered it possible within ten years. More than 75% approved financial aid for the GDR, though without tax increases to fund it. From a conversation with Nikolai Portugalow, a high-ranking emissar of Gorbachev's, Teilschik learned that Hans Modrow's suggestion of a treaty between the two German states had already prompted the Soviets to plan for "the unthinkable". With Kohl's blessing, Teltschik developed a path toward German unification. To his ten-point plan, entitled the "Ten Point Program for Overcoming the Division of Germany and Europe", Kohl added some additions and surprised all by reading it out in parliament on 28 November. Starting with immediate measures, the path shall flow through a contractual arrangement and the development of confederative structures to conclude with one federation. The plan was broadly accepted in parliament even by the opposition with the exception of the Green Party that endorsed the independence of the GDR, like many GDR civil liberties campaigners, in "a third way". The SPD was partly skeptical and divided. While the former chancellor Willy Brandt coined the expression on 10 November: "What now grows together, belongs together". Oscar Lafontaine, soon to be nominated as the SPD's chancellor candidate, picked out the central themes of the GDR as being the incalculable financial risks and the curtailing of the number of those leaving. The sudden announcement of Kohl's ten-point plan caused substantial irritation among European heads of states and Soviet chief Gorbachev. British Premier Margaret Thatcher saw international stability becoming endangered and raised doubts about the peacefulness of a united and restrengthened Germany. French President François Mitterrand was concerned that the German government could give up its tight commitment to the European integration process and instead focus on its national interests and ambitions for power. In early December 1989, he sought with Gorbachev to ensure "that the whole European process develops faster than the German question and that it overtakes the German development. We must form pan-European structures". Gorbachev informed West German foreign minister Genscher that Kohl was behaving "like a bull in a china shop". In light of these frosty reaction, the West German government viewed a meeting of the four Allied Powers in the Berlin Building of the Allied Government on 11 December 1989 as a demonstrative affront. Only the US government under George H. Bush at this time offered the West German chancellor support by already setting out the day after Kohl's 10-point plan its own interests in any potential German reunification. Kohl stressed that the driving factor behind the developments was the GDR populace and not the FRG government, which was itself surprised by the dynamics of events and had to react. He aimed to preempt a state visit by Mitterrand to the GDR on 20–22 December 1989 and planned talks with Minister President Modrow. Visiting Dresden on 19 December, Kohl spoke before a crowd of 100,000, who broke out into cheers when he stated: "My goal remains - if the historical hour allows - the uniting of our nation". When Mitterrand realized that, with the rapid change of circumstances in the GDR, controlling development from outside was not possible, he sought to commit the West German government to a foreseeable united Germany on two matters: On the final recognition of Poland's western border and on quickened European integration through the establishment of a currency union. In January 1990 the Soviet Union sent understanding signals by appealing to West Germany for food deliveries due to supply shortages. On 10 February 1990 Kohl and his advisers had positive talks with Gorbachev in Moscow, which freed up the path to reunification. After his election as Minister President in the People’s Chamber on 13 November 1989, Hans Modrow affirmed in his government statement of 16 November that – from the GDR viewpoint – reunification was not on the agenda. Since the end of October opposition groups had called for the creations of a round table. They released a communal statement: “In light of the critical situation in our country, which can no longer be controlled by the previous power and responsibility structures, we demand that representatives of the GDR population come together to negotiate at a round table, in order to established conditions for constitutional reform and for free elections. Aimed at her fellow citizens, the East German author Christa Wolf – who, on the night before the opening of the border had called for people to remain in the GDR – read out an appeal on television on 28 November entitled "For Our Country", whose first 31 signatures of support came from GDR artists and civil liberties campaigners as well as critical SED members. During a press conference on the same day, the author Stefan Heym also read out the appeal and within a few days, it had received 1.17 million signatures. It called for "a separate identity for the GDR" to be established and warned against a "sell-out of our material and moral values" through reunification, stating there was still "the chance to develop a socialist alternative to the FRG as an equal partner amongst the states of Europe". At the first meeting of the Central Round Table on 7 December the participants defined the function of the new body as an advisory and decision-making institution. Unlike the Polish example for this body, where the Solidarity delegates confronted the government, the Central Round Table in the GDR was formed from representatives of numerous new oppositional groups on one side and delegates made up in equal number from the SED, bloc parties and the SED-linked mass organizations on the other. To the approval of both sides, church representatives acted as moderators. The socialist reform program of Modrow’s government lacked support both domestically and internationally. On a visit to Moscow at the end of January 1990, Modrow admitted to Gorbachev: “The growing majority of the GDR population no longer supports the idea of the existence of two German states; it no longer seems possible to sustain this idea. […] If we don’t grasp the initiative now, then the process already set in motion will spontaneously and eruptively continue onward without us being able to have any influence upon it”. In order to expand the basis of trust for his own government at least for the transitional phase until free elections, Modrow offered the opposition groups at the Central Round Table on 22 January the chance to participate in government. The majority of these groups agreed a counter offer of placing candidates from the Central Round Table in a non-party transitional government. Modrow considered this an attempt to dismantle his government and rejected these suggestions on 28 January. After lengthy negotiations and Modrow’s threatening to resign, the opposition relented and accepted a place in the government as “ministers without portfolio”. However, when Modrow committed to a one-nation Germany a few days later, the United Left withdrew its acceptance due to “a breach of trust” and rejected being involving in the government. After the entry into the cabinet on 5 February 1990, all nine new “ministers” traveled with Hans Modrow to Bonn for talks with the West German government on 13 February. As had already occurred during Kohl’s visit to Dresden two months earlier, Modrow was denied the immediate financial support to avoid the threat of insolvency (although a prospective currency union had already been on offer for several days). The talks were largely unproductive, with Kohl unwilling to make any decisive appointments with the pivotal election only weeks away. The peaceful revolution is regularly commemorated and celebrated in Germany and other countries. On 18 September 2014, German president Joachim Gauck welcomed the heads of states of (partly) German-speaking countries Austria, Switzerland, Belgium, Luxembourg and Liechtenstein to Mecklenburg. They met in Bad Doberan, Warnemünde and the city of Rostock to commemorate the peaceful revolution of 1989 and to address the challenges of demographic change in Europe. ↑ "Joachim Gauck welcomes presidents to Mecklenburg to address demographic change and commemorate the Wende". Official Presidential Website. Retrieved 18 September 2014. Wikimedia Commons has media related to Peaceful Revolution.